The new version of ProMD EMS allows Japanese-speaking users to easily access the ProMD EMS system and control Media Links equipment. Media Links, a supplier of media over IP transport technology, has released a Japanese translation version of its ProMD Enhanced Management System that will make the software accessible to a wide variety of Asian region customers. “With such a large installed base of Media Links equipment deployed throughout Japan, it certainly makes the most practical sense to offer our Japanese speaking customers a network management system in their own native language,” said Toshiyuki Naka, senior vice president, Global Sales at Media Links. The new version of ProMD EMS allows Japanese-speaking users to easily access the ProMD EMS system and control Media Links equipment—including the MD8000 Series of Media over IP Transport solutions, MDX Series of IP Switches, the MDP3000 series of network edge devices, as well as the associated LAN and WAN networks. The ProMD EMS system is a multi-user software-based platform used to configure, provision, manage and troubleshoot small to large scale IP video and media transport networks. It gives network operators and broadcasters the ability to quickly bring new services online for studio, remote and field locations, all while monitoring and maintaining the performance and reliability of active circuits, trunks and network devices. The Japanese version was developed as part of the company's ongoing strategic efforts to provide quality solutions and a refined set of tools to make it straightforward for broadcasters and network service providers to maintain and operate complex media over IP transport networks. Media Links also introduced at InterBEE a series of new products for IP Video Routing, 4K/UHD transmission and Remote Production. The company introduced its latest 4K/UHD video transport and 100G switching solutions that offer the technology and functionality for these types of workflows to be successfully implemented. The company debuted its 100G Media-Centric IP Switches. Two versions of the MDX100G switch are available (32 and 48 port) and are designed specifically for aggregating multicast media streams whether compressed, uncompressed, and/or bi-directional. The Media Links IP Video Router system can accommodate up to 1920 X 1920 HD-SDI cross-points and offers broadcasters the high bandwidth capacity connections for bi-directional signal flow within a hybrid IP/SDI environment, including those that handle lots of data. For Remote Production Network workflows, Media Links showcased its MDP 3020 IP Media Gateway. Media Links’ 4K/UHD transmission portfolio now include several new 4K transport solutions, which offer broadcasters a practical upgrade path to 4K/UHD workflows. The MDP3040 is a two-channel 4K/UHD TICO lightweight compression encoder/decoder, supporting several configurations. With built-in TICO compression, transmission bandwidth is reduced, delay is ultra-low, and transport occurs without visually noticeable loss or distortion of content. Complementing the 4K transmission application is the MD003 CWDM video transport platform with its new 4K/UHD card incorporating TICO compression. Up to 8 channels of 4K UHD video signals can be transmitted over one optical fiber. This multi-channel, multi-service transport system is used for reliable and scalable signal transport over dedicated dark fiber infrastructure. 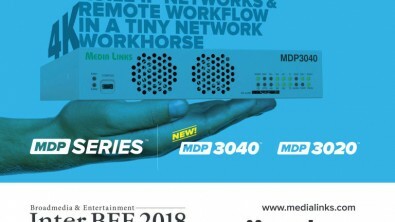 For Remote Production Network workflows, Media Links will showcase its MDP 3020 IP Media Gateway, which supports any type of Software Defined Network; from the edge to the core.